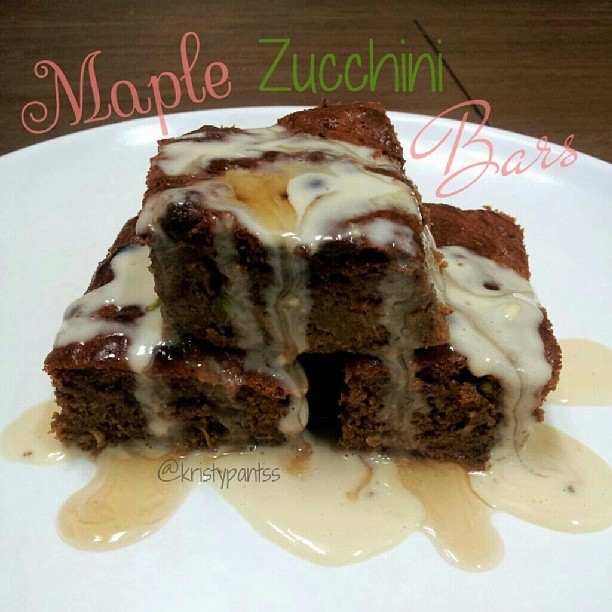 Ripped Recipes - Maple Zucchini Protein Bars! Home » Recipes » Snack » Maple Zucchini Protein Bars! Super moist and delicious, you won't even notice those healthy greens snuck in there! Ingredients for the bars; 1 egg, 3/4 cup coconut sugar, 1.5 cups grated zucchini, 1/3 cup coconut oil (or oil of choice), 1t vanilla extract, 1t maple extract, 1t baking soda, pinch of salt, 1t cinnamon, 1/2 t nutmeg, 1 cup oat flour, 1/2 cup whey protein powder. 1. Mix wet ingredients 2. add zucchini and stir 3. Sprinkle baking soda and salt over mixture 4. Add dry ingredients. 5 bake at 175C for around 25 mins or until toothpick comes out clean. Oven times will vary! For frosting, mix 1T vanila whey with 1T unsweetened almond milk and 3 drops french vanilla stevia. Drizzle over top along with walden farms sugar free syrup. Enjoy!! !